Take a break from the city and head to Rio Douro and Praia da Luz. Step off the beaten path and head to Palacio da Bolsa and Graham's Port Lodge. 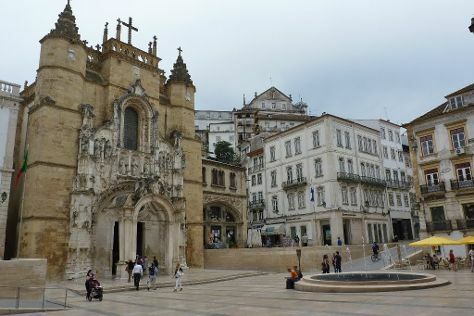 Get out of town with these interesting Porto side-trips: Cathedral of Santa Maria de Braga (in Braga), Centro Historico de Guimaraes (in Guimaraes) and Santuario de Santa Luzia (in Viana do Castelo). There's much more to do: go for a stroll along the water at Cais da Ribeira, learn about winemaking at Taylor, contemplate in the serene atmosphere at Porto Cathedral (Se Catedral), and take in the architecture and atmosphere at Clerigos Tower. To find where to stay, more things to do, reviews, and more tourist information, you can read our Porto vacation trip planner. Use the Route module to find suitable travel options from Philadelphia, USA to Porto. The time zone difference when traveling from Philadelphia to Porto is 5 hours. When traveling from Philadelphia in May, plan for slightly colder days in Porto, with highs around 68°F, while nights are about the same with lows around 53°F. Wrap up your sightseeing on the 17th (Wed) early enough to take a bus to Coimbra. Start off your visit on the 18th (Thu): contemplate the long history of Igreja e Mosteiro da Santa Cruz, then take in the spiritual surroundings of Old Cathedral of Coimbra (Se Velha de Coimbra), then contemplate the long history of Quinta das Lagrimas, and finally contemplate the long history of Portugal dos Pequenitos. For maps, reviews, more things to do, and tourist information, read Coimbra online itinerary creator. Take a bus from Porto to Coimbra in 1.5 hours. Alternatively, you can drive; or take a train. Finish your sightseeing early on the 18th (Thu) to allow enough time to drive to Obidos. Striking views of the Estremadura area and a famous medieval castle gave Obidos the name of Wedding Present Town. Start off your visit on the 19th (Fri): step into the grandiose world of Obidos Castle, take in the spiritual surroundings of Monastery of Alcobaca, and then enjoy the sand and surf at Praia da Nazare. For ratings, more things to do, reviews, and more tourist information, refer to the Obidos trip planner. Drive from Coimbra to Obidos in 1.5 hours. Alternatively, you can take a bus; or take a train. In May in Obidos, expect temperatures between 73°F during the day and 57°F at night. Finish your sightseeing early on the 19th (Fri) so you can drive to Lisbon. Step out of the city life by going to Praia da Aberta Nova and Ilha do Pessegueiro. You'll enjoy a bit of beach vacationing at Praia do Pego and Troia Beach. Go for a jaunt from Lisbon to Grandola to see Comporta Beach about 1:05 hours away. 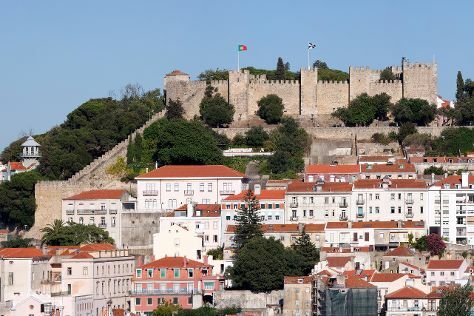 And it doesn't end there: wander the streets of Belém Tower, take in the spiritual surroundings of Jeronimos Monastery, pause for some photo ops at Arco Triunfal da Rua Augusta, and explore the historical opulence of Castelo de Sao Jorge. For where to stay, other places to visit, and other tourist information, go to the Lisbon itinerary maker. Drive from Obidos to Lisbon in an hour. Alternatively, you can take a bus; or take a train. In May, plan for daily highs up to 74°F, and evening lows to 57°F. Wrap up your sightseeing on the 23rd (Tue) to allow time to drive to Sintra. Surrounded by rolling hills and old mansions and castles, Sintra has become known as the first center of the European Romantic style. Kick off your visit on the 24th (Wed): step into the grandiose world of Castle of the Moors and then kick back and relax at Guincho Beach. For where to stay, more things to do, traveler tips, and more tourist information, you can read our Sintra vacation planner. Sintra is just a short distance from Lisbon. In May, daytime highs in Sintra are 74°F, while nighttime lows are 57°F. Wrap up your sightseeing on the 24th (Wed) to allow time to drive to Evora. Your inner history buff will appreciate Monsaraz Castle and Walls and Universidade de Evora. You'll discover tucked-away gems like Adega Mayor and Pulo do Lobo. The adventure continues: delve into the distant past at Almendres Cromlech, make a trip to Centro Historico de Evora, and take in the spiritual surroundings of Se Catedral de Evora. To see more things to do and other tourist information, you can read our Evora sightseeing planner. You can drive from Sintra to Evora in 2 hours. Alternatively, you can take a bus; or take a train. In May, daytime highs in Evora are 79°F, while nighttime lows are 54°F. Wrap up your sightseeing on the 27th (Sat) to allow time to drive to Lagos. On the 28th (Sun), kick back and relax at Praia Dona Ana, then wander the streets of Centro Historico de Albufeira, and then delve into the distant past at Castelo de Silves. Get ready for a full day of sightseeing on the next day: take in the dramatic natural features at Ponta da Piedade, then visit a coastal fixture at Ponta da Piedade Lighthouse, and then kick back and relax at Camilo Beach. To find traveler tips, maps, other places to visit, and other tourist information, refer to the Lagos custom trip planner. You can drive from Evora to Lagos in 3.5 hours. Alternatively, you can take a bus; or take a train. When traveling from Evora in May, plan for slightly colder days in Lagos, with highs around 74°F, while nights are about the same with lows around 59°F. Finish up your sightseeing early on the 29th (Mon) so you can travel back home.